Roger Keyes wrote: "To avenge his public defeat by the fencing master Ichimisai, Kyōguku no Takumi murders him. One of Ichimisai's daughters is also killed when she encounters Takumi; but Osono, the elder daughter, and her fiancé, Keyamura Rokusuke, who was Ichimisai's prize pupil, track Takumi down and accomplish their revenge." This is one of three prints dealing with the same play. Jan van Doesburg in his Ōsaka Kagami 大阪鏡, p. 56, says: "The centre sheet is the most dramatic of the three, with Utaemon's mie, or fixed pose, here accentuated by the use of small areas of saturated colours and a relatively large area of plain black." "Appearing in a bust portrait on a circular fan, Nakamura Utaemon III casts a menacing glare as the villain Kyōguku no Takumi, who murder the fencing master Ichimisai after the master defeats him. Ichimisai's death is avenged by his elder daughter, Osono, and her fiancé, Keyamura Rokusuke, a disciple of Ichimisai. Utaemon III, a superstar of the Osaka stage, played all three roles at he Kado theater in a tour de force of acting skill as he sought to mark his retirement from acting in the third month of 1825. He did not retire after all, but continued to act until his death in 1838. This famous print is one of several bust portraits of Utaemon III presented on fans, published at the time of his spectacular retirement performance. In addition to the actor's role and name, each print bears at center the inscription 'Isse ichidai atari kyogen' (The performance of a lifetime, hit play). In this striking example, the conceptual skill of the artist Hokushū is paired with the skillful engraving of the master block engraver Kasuke, whose name appears on the first state of the print. Their collaboration produced many prints of extraordinary artistic quality. Embossing, a technique often employed in privately commissioned surimono, is used here to create a realistic impression of the ribs of a fan. The red seal of the publisher, Ariharadō, is printed on the handle of the fan as if engraved in ivory." Quoted from: Masterful Illusions: Japanese Prints in the Anne van Biema Collection, p. 156. This is accompanied by a full-page, color illustration. There are other copies of this print in the Philadelphia Museum of Art and in the Kruml collection. 1) In Ōsaka Kagami 大阪鏡 by Jan van Doesburg, p. 56. 2) In Masterful Illusions: Japanese Prints in the Anne van Biema Collection, pp. 156-157. 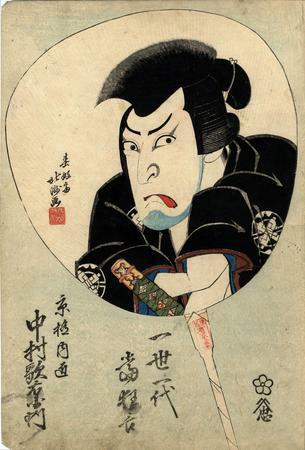 3) In Ikeda Bunko, Kamigata yakusha-e shūsei (Collected Kamigata Actor Prints), vol. 1, Ikeda Bunko Library, Osaka 1997, no. 164. 4) In color in Masterpieces of Japanese Prints: The European Collections - Ukiyo-e from the Victoria and Albert Museum, Kodansha International, 1991, p. 128. 6) In color in Ukiyo-e Masterpieces in European Collection 5: Victoria and Albert Museum II, Kodansha, 1989, #149. The crossed scrolls on this actor's robe is a Nakamura crest. This motif also appears on the costume of Nakamura Utaemon III (中村歌右衛門) as Arajishi Otokonosuke (荒獅子男之助) in #577 of the Lyon Collection. There are two other prints from this series of 5 in the Lyon Collection - see numbers 374 and 1233. The term 一世一代 or issei ichidai appears printed at the bottom center below the fan. This translates loosely as "performance of a career" or "once-in-a-lifetime performance". This is an expression used when an aging actor appears in his final role.